Review: Free Solo / It's Just Movies Review: "Free Solo"
El Capitan, Yosemite’s seemingly sheer gray façade, juts upward majestically reflecting the morning sunrise. Experienced rock climbers, with ropes, regard it as a dangerous challenge. So, Alex Honnold’s decision to try it without equipment or partner, in other words, free solo, seems suicidal. If the idea for this film is uncomfortable, the first free solo attempt summiting El Capitan, imagine seeing it with your son and having him exclaim throughout different points in the film, “I’ve climbed with that guy!” What? 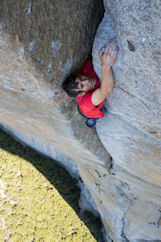 My reaction was not much different from Honnold’s own mother’s – or his girlfriend’s. It is puzzling and confusing that a person so close to us risks his life with such enthusiasm. It turns out that my 42 year-old son hadn’t been telling me about his climbing because he knows the dangers and didn’t want to scare me. Honnold’s mom, whose son explains that he only tells her after each venture is over, insightfully but sadly recognizes that this is his passion. How could she not support what brings him such joy? Honnold’s girlfriend, as she falls deeper and deeper in love, is asking Honnold to love her more than free soloing – and stop risking his life. She wants to keep him in her life and have a family. Since 1905, 31 have died climbing El Capitan with equipment. 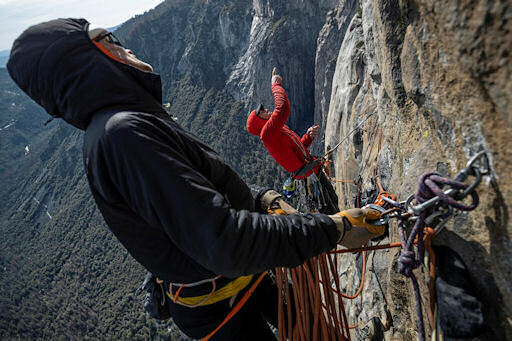 Famed climber and photographer, Jimmy Chin and his wife, filmmaker Elizabeth Chai Vasarhelyi, went to extraordinary lengths to position cameras in extraordinary positions to catch the beauty of Honnold’s attempt. Leading up to the climb, Chin and Vasarhelyi do a study of Honnold. He is filmed as he begins a new relationship, as he camps in his van and as he studies and practices for his climb. Chin interviews him with questions about motivation, risk, and death. The entire film is carefully, artfully and magnificently created. It is one of the five Oscar nominees with the winner announced in less than three weeks.